The Helen & Allan Cruickshank Sanctuary is a great place for an early morning stroll through the scrubby flatwoods. While weekly visits had been a longstanding tradition for us, we have been on a hiatus for the past few months. The sanctuary is most well known for its optimal Florida Scrub-Jay habitat. 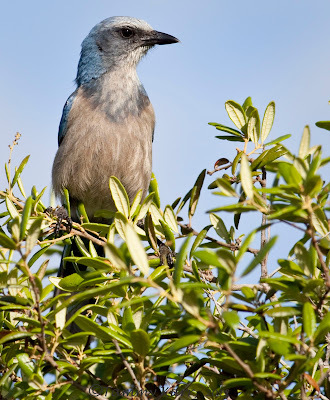 The Scrub Jays here aren't hard to find as they often find you before you find them. They usually congregate in small groups and can be seen in multiple spots along the one-mile hiking trail. This Scrub-Jay was waiting at the trail head to greet us. As we hiked the trail, a very bold Scrub-Jay came out of nowhere and landed on my son's head as I carried him along on my back. Luckily it didn't stay there long as I know my son was quite startled. A short ways up the path we encountered this Scrub-Jay, which I believe was the same one we encountered a few minutes earlier. This Scrub-Jay's bill deformity was immediately apparent. I'm not sure if this bird had been injured or if it was born with this deformity. Another apparent fact was, this guy was very bold! It made repeated dive bombs onto my head, and followed us for quite a while. (It was easy to recognize!) I've read that Scrub-Jays, like Crows, are attracted to shiny objects, and I did have shiny sunglasses resting on my head, or it may have been looking for a handout, which it definitely would not be getting. (Feeding Scrub-Jays is dangerous to their health!) 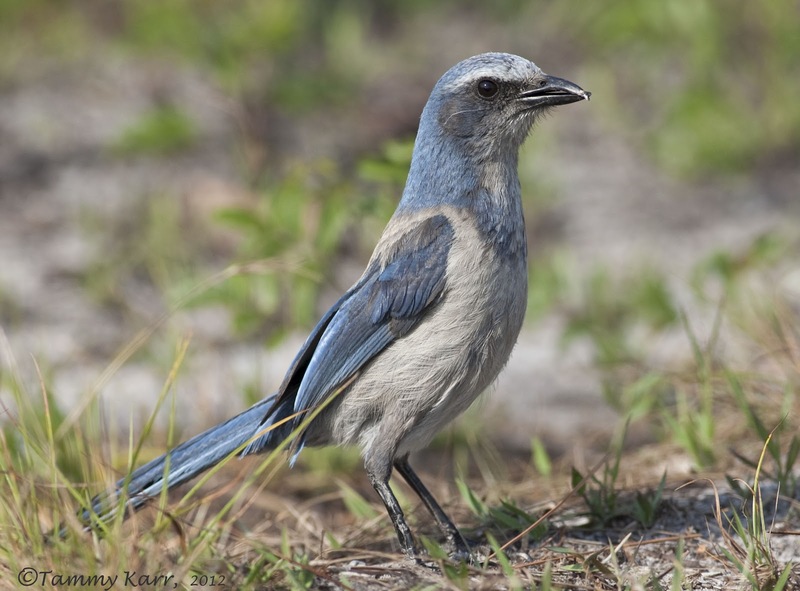 I'm not sure if this bird's deformity interferes with its ability to forage as Scrub-Jays use their bills to crack acorns against hard objects. 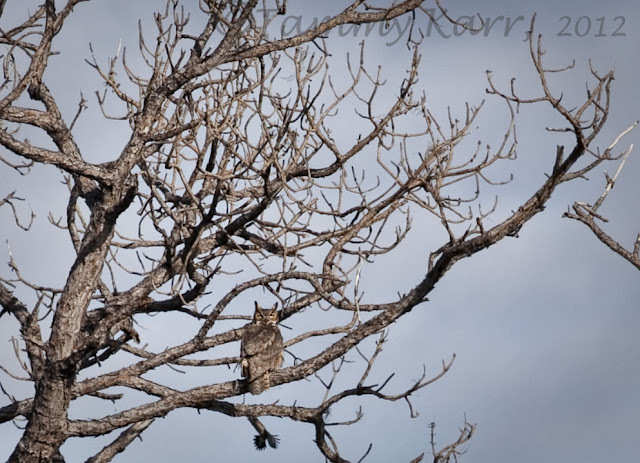 A pair of Osprey were carrying on quite a loud conversation in a nearby tree as numerous Red-bellied Woodpeckers were tree hopping in a foraging frenzy. Northern Mockingbirds, Mourning Doves, Grackles, and a Gray Catbird were also in the area. While I've seen Great Horned Owls here in the past, it was a rather unexpected surprise to see one emerge for the brush with some prey. It flew to a distance tree, so I as unable to see what was for breakfast. Great Horned Owls have always been a favorite bird of mine! 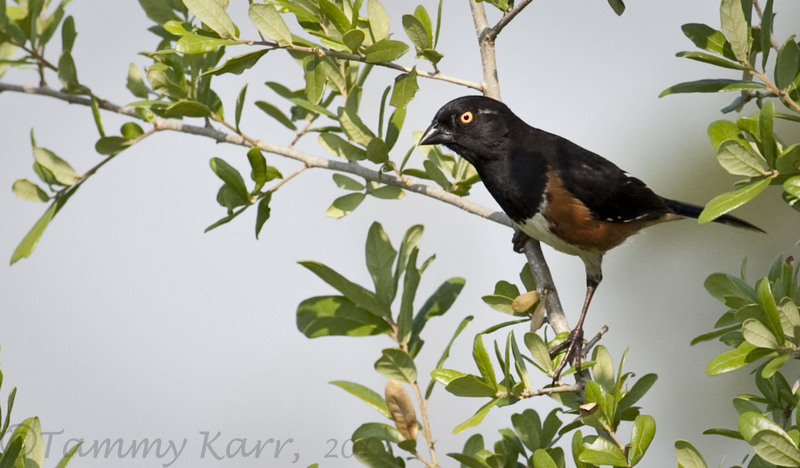 This Eastern Towhee was perched close to the trail as it spoke with another Towhee that was hiding somewhere among the scrub. I spotted a plump bird in the distance perched on a branch of a tall tree. I took a few photos for identification purposes, guessing it would leave as we made our way up the trail. I wasn't quite sure what it was, thinking it looked somewhat Quail like. 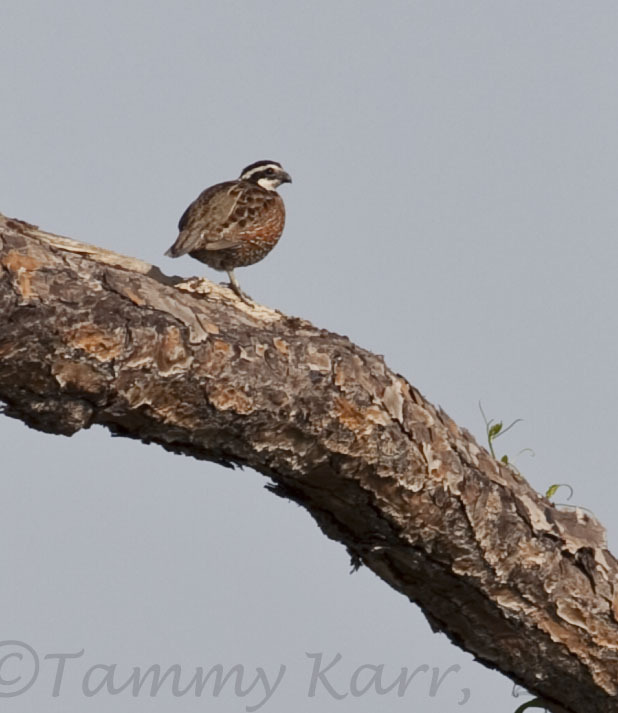 I was able to tell it was a Northern Bobwhite upon zooming in on my photo. While these pudgy fellows are known to frequent this sanctuary, this was my first sighting of one here. It's a pleasure to see all these lovely pictures, light, scharpnes and colors are wonderful Tammy. Brilliant images, my favourite is the Jay, it is well photographed. What a wonderful day out, Tammy! I was especially surprised to see the picture of the Great Horned Owl, a bird I've only heard, but have yet to see. What beautiful portraits. The fellow with the deformed beak seems to make up for it with attitude! 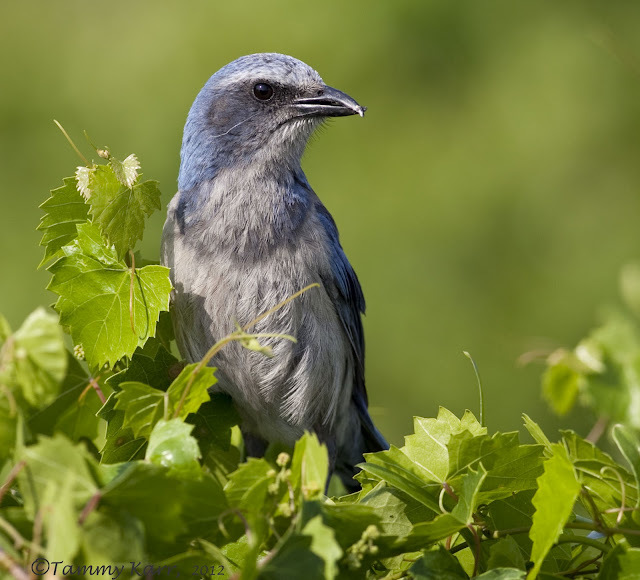 Great photos of the crossbilled Jay. I really like the Owl shot too, and it's gotta be cool to see Bobwhites. Looks like another great birding location in your area. neat to see the bobwhite! haven't seen one of those for years! 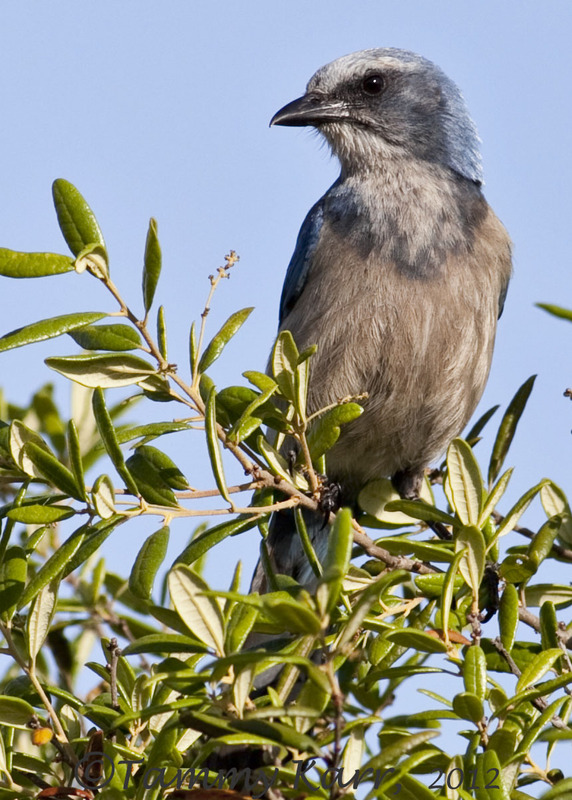 your scrub jays are handsome birds! great shots! hope that crossbill doesn't keep him from eating well. Really nice close up shots. Very clear and sharp! Stunning serie of amazing birds. So many great locations you visit Tammy and another great variety of shots. 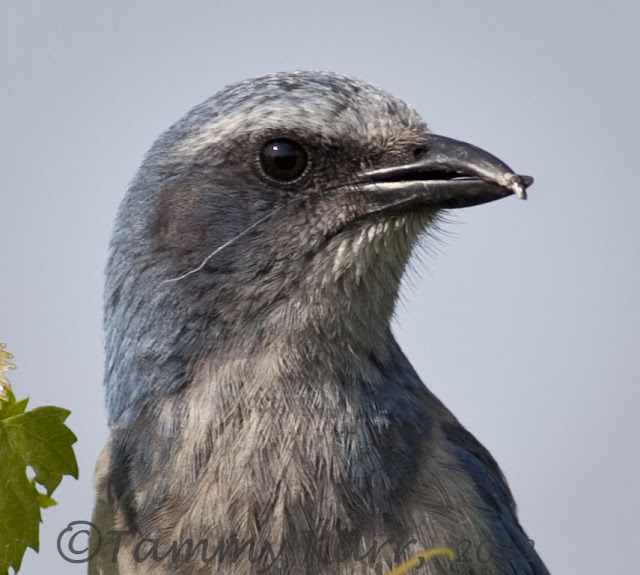 A very interesting looking bird, the Scrub Jay and obviously the bill deformity is not too much of a hindrance Tammy. Great shots of beautiful birds. A place we will try to visit. Fantastic portraits of the jay, Tammy! They're gorgeous photos! Love the owl in that tree, too! Stunning images as usual Tammy, however, I think the third one of the Jay in the bush with the beautifully diffused, green background is sublime. Magnificent photos Tammy! Beautiful that Jay bird. Don´t have that kind here. Great shots of the beautiful birds. Excelente serie,Tammy, todas las aves muy bellas, y la sorpresa del buho entre las ramas del arbol. Como siempre, tus aves y tus fotos me hacen disfrutar. A terrific set of photos Tammy. The Scrub Jay was an obvious show off, some great shots of that fellow. Congrats on the Bobwhite. I'm in awe of your gorgeous photos, Tammy. I especially enjoyed the northern bobwhite as is been quite a few years since I've seen one.